I just wanted to give you some updates on what's happening with the funeral services for the late Coach Lee. Here is the information that I have received as of Tuesday evening. If you have any questions please feel free to contact Kim Galindo at 925-260-3153. The service is a potluck event on Sunday and they would like everyone who wants to make it out, to come. There has also been an account setup at Washington Mutual Bank under the name of Coach Lee if you would like to make a donation to the Lee family. Thank you for your continued time and support and we'll hopefully see you out there on Thursday and Sunday. Resident of Concord Robert passed away March 7, 2008 in Concord. He was born in Concord, CA July 12, 1959. 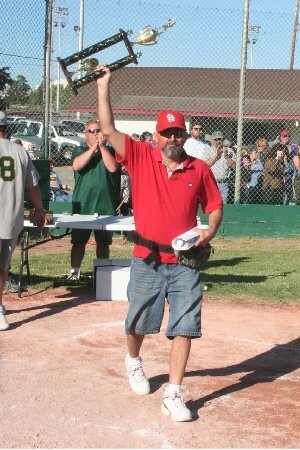 Bob coached baseball for many years at Concord American Little League, where he was honored as 2007 "Coach of the Year." He recently started coaching baseball at Concord High and was also a youth soccer coach. He was a member of Union Local 16, Heat, Frost and Insulators, and California Water fowl Association. He was an avid hunter, paintball gamer, and enjoyed being a cowboy and country western fan. Bob is survived by his wife of 21 years, Dianne; children Bobby, Tommy, and Tori; parents Robert and Janet Lee; siblings, Rhonda and Roland Lee, and by many nieces and nephews who will miss his quick wit and sense of humor. Bob will also be missed by his loyal hunting companion, "Lady". Visitation will be Thursday, March 13, 2008 from 5:00 p.m. to 8:00 p.m. at Ouimet Bros. Concord Funeral Chapel, 4125 Clayton Rd., Concord. 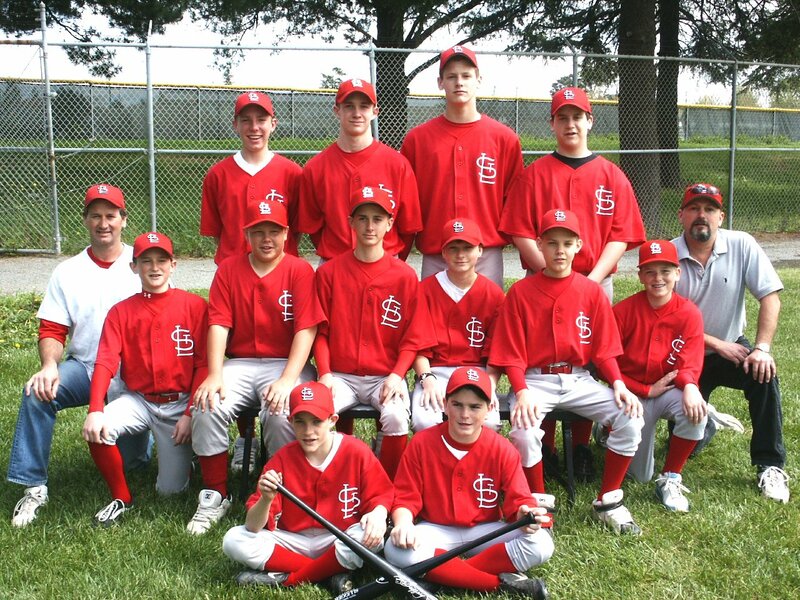 A Celebration of Life will be held at 2:00 p.m. Sunday, March 16, 2008 at the Concord American Little League Park, Concord. Everyone is encourage to wear baseball attire to Bob's celebration of life, and be prepared to play some "Cardinal Ball". Published in the Contra Costa Times on 3/12/2008. Last year after a game that the Cardinals beat up on a team from Clayton and I got an email from a co-worker whose son played for Clayton and she was mad because we played so well. She said. " Hey nice game on Saturday... at least for you guys :( I hate to admit it, but I really didn't like your team the first time we played them. You have so many good players! !You guys really do have a great team, It is nice to watch, just wish it wasn't against us Ha, Ha!" I called her back and explained to her that I felt the same way about the Cardinals back before I meet Bob Lee. You would see him sunglasses on, beard & his Cardinal hat on and you would assume he was not approachable if you never talked to him before. After I introduced myself to Bob for the first time my opinion changed; I thought he was a great guy. I asked her if their coach works with all the boys on the team or just the good players; does he spend extra time with the players that were not starters to make them better, and she said not really. I then told her about Bob, how he worked with everybody on the team and that he would work hard with the players that were not starters, because what he loved to do is coach and he took pride in making everyone on the team a better player and that it is why we had so many good players. The reason Bob Lee's Cardinal teams were so successful is because they were so well coached; aggressive base running, and fielding. Throwing the ball to the right cut off man or base always seemed automatic and was no accident. Bob did not do it by himself because he had great coaches helping him. He would roam the field during practice and quietly coach the boys during fielding and batting practice. The assistant coaches were usually the strict ones enforcing the discipline while Bob taught technique. Sort of a good cop, bad cop. I told Bob about this email from my co-worker and he felt kind of bad. I told him that I called her and explained to her and not to worry because that is how I felt before I met him and I have now seen both sides. I had only known Bob for a short time but we developed a friendship. Had I known what a great guy he was I would have introduced myself to him the first time I saw him. This should be a lesson to everyone to never judge a book by it's cover. My oldest son loved Bob so much that he played for him last year as a fifteen year old after his freshman team season was over just to be with him and help him win the Lewis Cup. Bob also made my life easer as a parent by being a mentor to my son. I could call Bob and say could you talk to him about this or that and he would come right over or call him and they would talk it out. They would talk about baseball, paintball. They were very close, just like many other of Bob's former players that kept in touch with him. I guess it's the kind of thing that if you have to explain it you would not understand. Bob will be greatly missed by almost everyone that had the privilege of knowing him or having their child coached by him. I would like to thank Bob's family for sharing him with us and our thoughts and prayers are with them.